Era da molto tempo che volevo leggere questo romanzo. Finalmente ci sono riuscita. E ve lo consiglio, really. Intanto l&#8217;autore stesso e la storia della pubblicazione di “La vita davanti a sé” meriterebbero un approfondimento a parte. 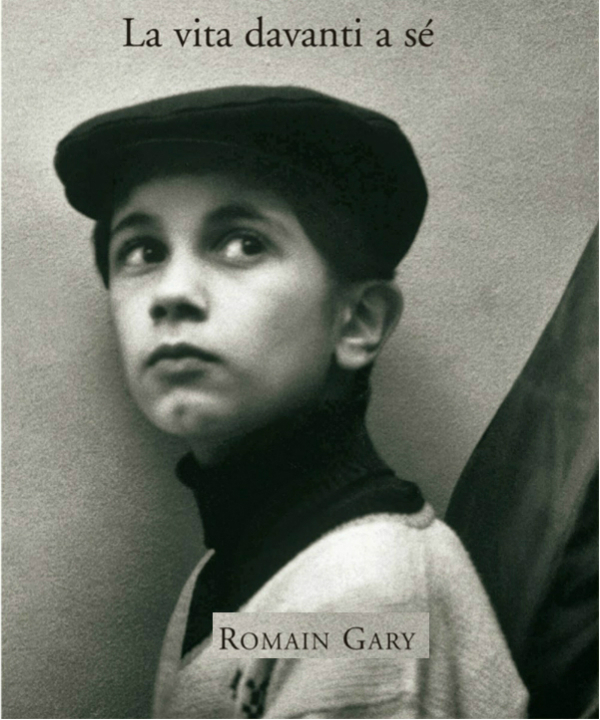 Romain Gary, He was a successful writer but also a person of great charm and exciting life,,it,After his death,,it,planned in detail,,it,it was learned that behind the pseudonym Emile Ajar,,it,mysterious author of this work won the Prix Goncourt,,it,It was he who for,,it,years had left insulting critics who thought him a finite writer,,it,The main character and narrator of this work is Momò,,it,His vocabulary,,it,figures of speech,,it,mistakes and of course the stories he tells us,,it. Dopo la sua morte (pianificata nel dettaglio) si seppe che dietro lo pseudonimo di Emile Ajar, misterioso autore di questa opera vincitrice del premio Goncourt, c&#8217;era proprio lui che per 5 anni si era lasciato insultare dai critici che lo ritenevano uno scrittore finito. Personaggio principale e voce narrante di quest&#8217;opera é Momò. Il suo vocabolario, i modi di dire, gli errori e ovviamente le storie che ci racconta; Momo is all about from the road,,it,from that Belleville,,it,multi-ethnic district of Paris known to lovers of Pennac,,it,that is his life "school",,it,Why has Momò,,it,ten years,,it,He lives on the sixth floor of a tower block in a sort of board-kindergarten for children of prostitutes,,it,never saw her parents and at school,,it,they did not want,,it,Madame Rosa,,en,only familiar figure '' for him,,it,manages retirement respecting the traditions and culture of origin of its guests,,it,Momò to have the precepts of Islam,,it, da quella Belleville, quartiere multietnico di Parigi noto agli amanti di Pennac, che è la sua “scuola” di vita. Perchè Momò ha (perhaps) dieci anni, vive al sesto piano di un palazzone in una sorta di pensione-asilo per figli di prostitute, non ha mai visto i suoi genitori e a scuola, quella vera, non l&#8217;hanno voluto. Madame Rosa, unica figura “familiare” per lui, gestisce la pensione rispettando le tradizioni e la cultura di origine dei suoi ospiti (per Momò sono i precetti dell&#8217;Islam, Moïse to those of Judaism,,it,Li maintains and protects as it can but she too has its problems,,it,"straight" they do not always arrive and have to make do with what there is,,it,The children occasionally are uncontrollable and she's too fat for the six flights of stairs,,it,Plus his past,,it,prostitute before and then deported to Auschwitz,,it,He has left deep marks in his soul,,it,Most worrying for Momo,,it,Madame Rose is aging,,it). Li cura e protegge come può ma anche lei ha i suoi problemi: le “rette” non sempre arrivano e bisogna arrangiarsi con quel che c&#8217;è. I bambini ogni tanto sono incontrollabili e lei è troppo grassa per i sei piani di scale. In più il suo passato (da prostituta prima e da deportata ad Auschwitz poi) ha lasciato segni profondi nella sua anima. E, cosa più preoccupante per Momò, Madame Rosa sta invecchiando. What the boy has understood life owes it to her and a group of colorful characters,,it,the old Hamil,,it,from which,,it,plus some old-fashioned interlayer,,it,borrowed admiration for Victor Hugo,,it,It is not an easy life to Momò,,it,always in contact with its cruder aspects and "dirty",,it,But,,ca,thanks to his innate sensitivity and a good dose of irony,,it: il vecchio Hamil, per esempio, dal quale, oltre a qualche antiquato intercalare, ha mutuato l&#8217;ammirazione per Victor Hugo. Non è una vita facile quella di Momò, sempre a contatto con i suoi aspetti più crudi e “sporchi”. Però, grazie alla sua innata sensibilità e a una buona dose di ironia, laying its simple look but at the same time keen on the events of drawing life lessons and reflections on their deeper meaning,,it,And he told them simply and without false morality,,it,His spirit of survival and help of the community around them preposterous allow the boy to face and manage,,it,respecting her beliefs,,it,the most difficult time in its short but intense existence,,it,In the future there maybe a little,,it,of tranquility,,it. E ce li racconta con semplicità e senza falsi moralismi. Il suo spirito di sopravvivenza e l&#8217;aiuto della strampalata comunità che li circonda consentono al ragazzino di affrontare e gestire, rispettando le sue convinzioni, il momento più difficile della sua ancora breve ma intensissima esistenza. Nel suo futuro c&#8217;è forse un po’ di tranquillità. Moreover, still he has a long life ahead of him,,it,The style of this novel might seem difficult,,it,Do not be scare,,it,the voice of Momo,,it,because it is he who speaks,,it,onore a Gary,,en,Perhaps it takes a while,,it,to "get" but,,it,once you are including its funny way of expressing,,it,will conquer,,it,despite the topics are certainly not light,,it,the story of Momo is always light-hearted and cynical,,it,tender and poignant,,it,Some thoughts then,,it,at forty years later,,it,They are present in significantly,,it,An unmissable book,,it. Lo stile di questo romanzo potrebbe sembrare difficile. Non lasciatevi spaventare; la voce di Momò (perchè è lui che parla, onore a Gary) forse ci mette un po’ ad “arrivare” ma, una volta compreso il suo buffo modo di esprimersi, vi conquisterà. E, nonostante gli argomenti trattati non siano certo leggeri, il racconto di Momò è sempre scanzonato e cinico, tenero e struggente. Alcune riflessioni poi, a quarantatré anni di distanza, risultano attuali in modo significativo. Un libro imperdibile, read them,,it,NATURAL BORN READER - LIFE BEFORE SELF,,it. A VOLTE RITORNANO: IL MARSUPIO!